OXFORD, Miss. 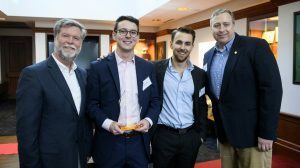 – An online, captive business concept that connects high school students with college students for homework took first place in the 14th annual Gillespie Business Plan Competition at the University of Mississippi. Shortwork LLC, conceived by Will Tribble and Sam Harres, is a tutoring app for high schoolers looking for solutions to homework questions. With this model, customers pay $3 to submit a photo of their homework problem, and Shortwork’s approved solvers claim the problems and respond with filmed explanations of the answers. “We plan to use the Gillespie prize to create a significant social media presence while offering plenty of sign-up incentives for both customers and solvers,” said Harres, a junior accounting major from Columbia, Illinois. Shortwork won $10,000 and a year of free office space at the Innovation Hub at Insight Park, the university’s business incubator. “We are thrilled to have the Gillespie Business Plan Competition in the school of business since it provides not only an experiential learning opportunity for budding entrepreneurs, but also because it provides seed money to actually start the business they are pitching,” said Ken Cyree, dean of the School of Business Administration. In third place was Fraze, winning $2,500. Founded last fall, Fraze sells custom, embellished sunglasses that are fun for parties, souvenirs and group trips. The frames typically feature bold colors and beads, and customers can customize their own glasses for any occasion to look unique on social media. “It has been so fun watching Fraze grow, and competing in the Gillespie competition helped us gain skills that will be important in the future of our business,” said Lindy Goodson, a sophomore from Maryville, Illinois, majoring in integrated marketing communications and the company’s other co-founder. This year, 38 student entrepreneurs entered the competition. An internal business school faculty panel evaluated all entries and selected 16 businesses to advance in the contest. The semifinals featured 16 participants presenting eight-minute pitches to a panel of judges. The top six advanced to the final round on April 20. Presentations were followed by 10 minutes of questions from judges. The judging panel was: Lawrence Adams, a Jimmy John’s Pizza franchisee; Jeff Conley of Conley Buick GMC in Florida; Jan and Lawrence Farrington; Mac Haik of Mac Haik Enterprises; Liza Cirlot Looser of the Cirlot Agency; Josh Mabus of the Mabus Agency; Johnny Maloney of Cowboy Maloney’s Electric City; John Oxford of Renasant Bank; Stuart Coleman of Chevron; and Benton Turnage of Gulf Point Advisors. Besides the winners, others competing in the finals were Axiom Materials, a building demolition and material recovery firm; DeltaTech, a co-worker space that targets low-income Mississippi Delta communities; and Subly, an app for students interested in sub-leasing their apartments or rooms. For more information about the Gillespie Business Plan Competition, go to http://olemisscie.com/programs/gillespie-business-plan/.